While there’s no shortage of project management software or cloud collaboration tools, many teamwork platforms treat content as an afterthought. Avatars, security controls, and organization can’t help business become more efficient if project materials themselves go by the wayside. Volerro takes the labor out of content collaboration and focuses on simplifying content sharing. The Volerro application enables teams to create, share, and refine content of all types – documents, images, videos, web links and more. Like other project management tools, Volerro provides administrative controls, cloud storage, and data security. Volerro operates in web browsers as well as mobile devices. The startup distinguishes itself with a couple of simple and effective content management tools. In addition to Dropbox integration and drag and drop technology making it easy to move files into projects, annotations give teams a great tool for combining and gathering feedback on a piece of collaborative content. Point and click anywhere over content, and you open up a dialogue box, where you make your annotations. A comments pane to the right of the file allows multiple team members to view all relevant annotations. Hovering over push pins on the annotated file highlights respective notes in the comments pane. Another simple click makes it easy to view files without any annotations. Work on static files as well as running videos – annotations integrate seamlessly into any type of project. Watch a demonstration on how this feature streamlines and clarifies the editing process in this video. Boards, in the spirit of the Japanese Kanban (a much lauded billboard scheduling system), break projects down into stages or steps. 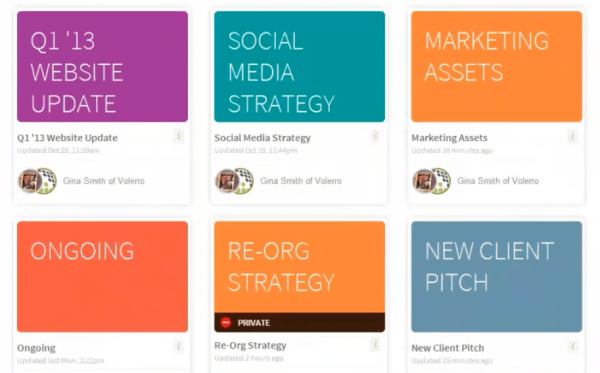 Within each board, content can be added, ordered, shifted, and shared. Volerro likens its boards to virtual buckets that hold any type of content – PDFs, PSDs, Office docs, images, video and audio. The board method has a proven track record of boosting productivity. What’s more, boards accommodate the way teams already function, so there’s no disruption of workflow or confusion amongst team members. Instead of suggesting how you organize your projects in terms of tasks and to-do lists, boards can be named and organized however they might best fit specific purposes. Convenient scrolling left and right shows all of the boards (and the contents of each) within a particular project. View boards in card, post or table format. Create notes at the bottom of each board just like you would use post-it notes, which can then be added, deleted, edited, or moved from board to board. Watch the board method in action in the following video. Take advantage of a free trial period now. Create up to three projects for free or store up to 100 MB of data without charge. 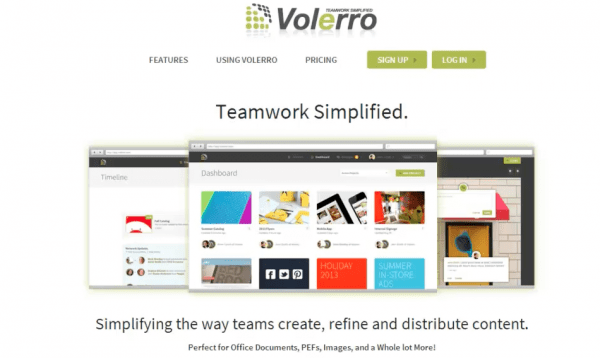 There’s no limit to the number of users, which sets Volerro apart from many team collaboration applications. After exceeding the limits of the free trial period, monthly plans are priced according to storage capacity. For more pricing details, visit here. Volerro is based in Minneapolis, Minnesota. CEO Kevin Lynch previously founded Nistevo Corporation, a logistics and supply chain software company he led from 1997 until a 2006 acquisition by the Sterling Commerce software division of AT&T. Before Nistevo, he was the co-founder and President of a web application development platform as well as the owner of an engineering consultancy. For more information about Volerro, visit here.